Fall visitors to our Fair Oaks Horticulture Center water-efficient landscape will find many hardy shrubs, blooming perennials and shimmering grasses that do well in the Sacramento area with less water while attracting bees, butterflies, birds and other beneficials. Fall is planting season in the Sacramento area. Pleasant fall weather allows roots to establish ahead of the rainy season. Natives and plants adapted to our hot dry summers appreciate the head start provided by planting in warm soils ahead of the rainy season. While new plants may not be showing much in the way of fresh growth above ground, winter rains allow the roots to expand deep into the soil providing the basis for abundant shoots, leaves and bloom come spring and summer. Fall is also a good time to plant spring bulbs. Many narcissus, daffodil and brodiaea varieties do very well here with no summer water. We have featured a few of our bulb favorites in the winter and spring plant lists. Below is a list of a few of our fall favorites that grow well for us in the Fair Oaks Horticulture Center garden. As the weather cools, many of us start cooking stews, soups, stuffings and stocks. A favorite culinary flavoring is the aromatic (thanks to the essential oil ceneole), fragrant leaf of the Mediterranean Laurus nobilis also known as sweet bay or Grecian laurel. The leaves of this evergreen, versatile tree, multi-trunked shrub, container plant, hedge or topiary can be harvested year round. Historically a garden and culinary favorite, ancient Greeks made garlands and crowns from the branches and leaves to honor bravery, victory and heroics. The commonly used phrases “resting on your laurels”, poet laureate and baccalaureate also originated from old Greek roots. Sweet bay is a member of the primarily tropical Lauraceae family, which includes avocados, cinnamon, camphor and the California native bay laurel, Umbellularia californica (which can also be used as a flavoring agent, but is not as popular). 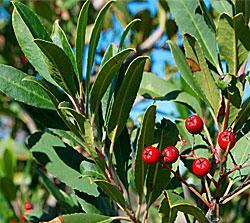 Bay laurels grow well in Sacramento with some afternoon shade to protect from sunburn. Not overly picky about soils, they do prefer well drained, slightly acidic locations. 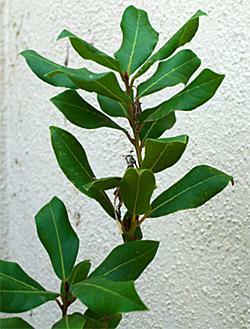 Small bay trees do well in pots due to their slow growth but can reach 20 to 40 feet tall in landscapes. Easy to propagate from seeds (flowers are insignificant and berries are often overlooked) or cuttings and forgiving of shearing, pruning and hedging they make a good choice for local gardens. Although very water-wise, a deep watering every 2 to 3 weeks in the summer will help the tree maintain vigor. If you are unfamiliar with the tree come visit the WEL where it is located along the fence bordering the community garden in the Mediterranean climate entrance garden. There is also a smaller tree in the herb garden. 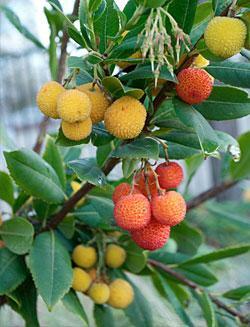 This easy, fast-growing native shrub from Hawaii does well in semi-shady, well-drained areas of our garden. It requires little water. Spreading by underground rhizomes, it has felty, gray-green leaves and tall flower spikes bearing magenta tubular flowers that are attractive to hummingbirds. The flower spikes were blooming late into December last year. The plant is said to be deer resistant and hardy to 0ºF. It grows 4 to 5 feet high by 2 to 3 feet wide. This evergreen, low growing, sun loving perennial comes from the central California coast. The attractive blue gray foliage is covered late summer through fall with 1 inch golden-centered lavender flowers which attract butterflies. It is a cool compliment to our bright red California fuchsias in the Native Garden. 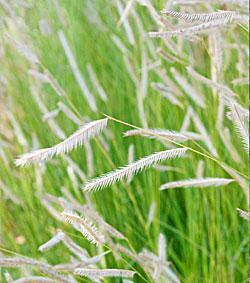 For most of the year, this warm season mounding ornamental grass is just another evergreen background plant. But, in late summer and early fall just as other summer blooms fade, an otherwise nondescript evergreen grass takes center stage in the FOHC parking lot bursting with show stopping persistent, vibrant, gauzy, pinkish-red, waving panicles rising up to 2 feet above the thin dark green mounding leaves. It is guaranteed to grab attention as visitors enter the front gate. Pomegranates, which are natives of Northern Africa, Iran, Afghanistan, and the Himalayas, have been in California since the 1770s. Featured at the entrance to our "Commonly Available" garden area, this dwarf variety bears fall ripening fruit that is primarily decorative. It is generally evergreen in Sacramento. Tolerant of many soil types, including alkaline soils, heat and cold, and drought tolerant, it makes a good foundation shrub, hedge, accent or small tree. ‘Nana’ grows to 3 feet high by 6 feet wide. This attractive native of the United States east of the Mississippi River grows to 80 feet tall by 50 feet wide. The leaves turn a brilliant golden scarlet with cold autumn nights and hang on throughout winter until pushed off by spring buds. 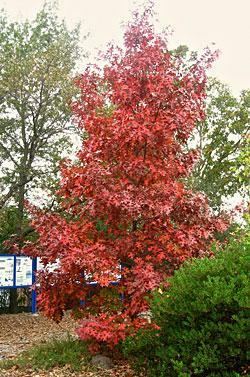 Adaptable to a wide variety of soils, and deep rooted, the scarlet oak is commonly used as a street, parkway and lawn shade tree. It is among the trees offered to homeowners by the Sacramento Tree Foundation. Commonly called Autumn sage, these evergreen members of the sage family with charming red, pink, red and white blooms (depending upon variety) start blooming in spring and often bloom non-stop through fall, especially if spent flower stalks are pruned back. They typically grow 1 to 4 feet tall and wide. If properly sited in full sun or part shade, they are practically ‘goof proof’, easy care, drought tolerant plants that attract hummingbirds, bees and other beneficial insects. 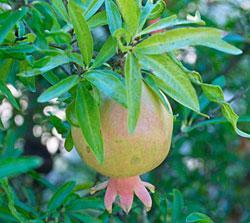 They can be pruned in late winter to keep compact. 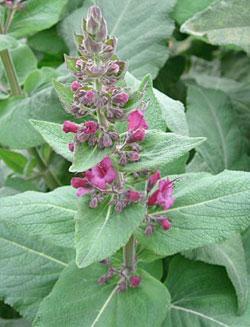 Also known as velvet sage, S. leucantha is a native of eastern and central Mexico. A moderate sized late summer/fall blooming perennial star in our far parking lot bed, it will bloom abundantly from late summer until the first frost especially if spent blossoms are removed just as they begin to fade. 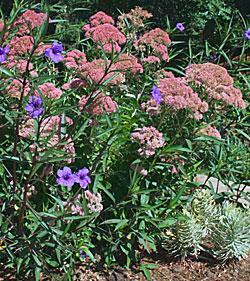 The size (2-1/2 feet tall and 4 feet wide) of our ’Santa Barbara’ cultivar is not as large as many other varieties. Very drought tolerant once established, the soft grayish green leaves set off brilliant purple flower stalks that make good cut and dried flowers. 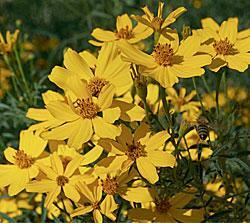 Plant in full sun, well drained soil and reduce summer watering for the best bloom. 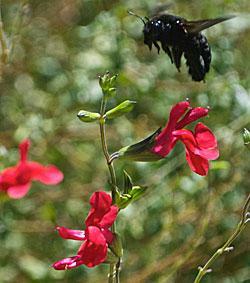 Mexican bush sage will die back to the ground in winter and may not survive a severe frost. If it does not die back during a mild winter, the plant should be cut close to the ground before spring growth begins to maintain a more compact shape and control flopping flower stems. ‘Autumn Joy’ is a hybrid hardy sedum that starts blooming in late summer with rosy pink flower clusters on upright, succulent green, round leaved stems reaching up to 2 feet tall. Bees love the blooms. As the flowers age, they turn coppery pink then bronze. Appealing as cut flowers, the entire plant dies to the ground in winter. 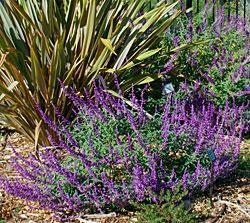 It does well as a companion plant to salvias, euphorbia and ornamental grasses. It is shown here with ruellia and a small ‘Tasmanian Tiger’ variegated euphorbia. Preferring well-drained soil (we have it in our raised entrance bed), and sun, they do well here with afternoon shade, little maintenance and low water. Also known as tangerine scented marigold, this large shrubby herbaceous perennial originates in canyons at elevations between 4,000 to 6,000 feet from southern Arizona throughout Mexico. A member of the sunflower family, it is covered in the fall with vibrant, yellow daisy-like flowers that attract bees and other pollinators. The very aromatic, airy foliage can cause dermatitis so care should be taken when pruning. We have 2 varieties in our garden, one that reaches 6 to 8 feet in height and a dwarf variety that grows to about 4 feet tall. Both can reach 4 to 6 feet in width. 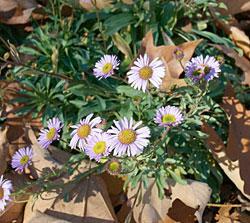 Copper canyon daisy prefers good drainage and is drought tolerant. In fact, it blooms more abundantly when not overwatered. Blooms are triggered by shorter days in fall, so an overcast period earlier in the year may produce some additional bloom. If overwatered or given too much shade, the plant may become leggy. Hedging back the stems may reduce subsequent flower production, however. Fall blooms cover the bush and last until frost. Plants will die back in winter under frost conditions. We have found that our plants do best when cut back close to the ground just as spring growth begins.